A special element was featured in a rally for village cleanliness in Maira, Punjab. 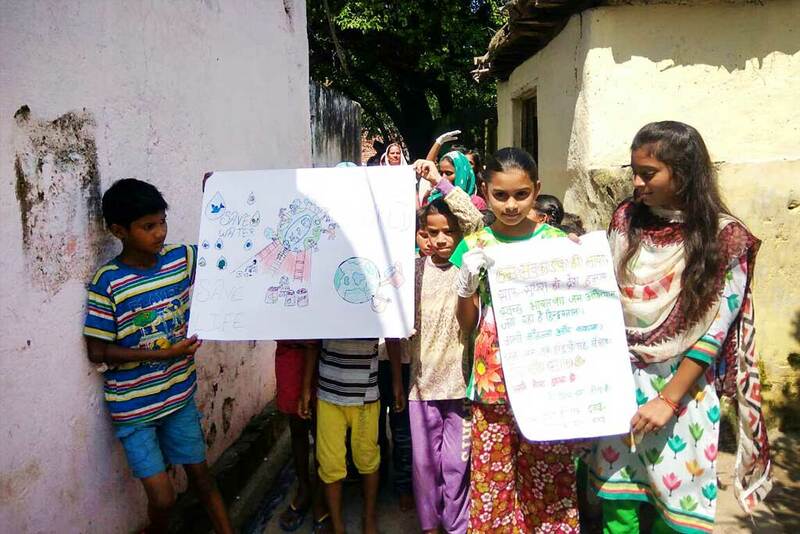 Children carried posters asking villagers to save water and stop littering. The children made this decision to step forward and ask that we take care of our environment. As the effects of environmental damage over the past decades began to reel their frightening heads through climate change and unbelievable levels of pollution, it is our children that will have to suffer the consequences more than us. It is they who will have to take more responsibility than us to reverse the impact. It is time to realise that all children are equally valuable to our society and the way we govern ourselves. They are our future citizens. They are our most important investment in the formation of a supportive, happy and unified state. And yet, the numbers in Rural India for child health are staggeringly low. For example, in our villages, 402 children out of 483 studied were identified as underweight. When it comes to girls, it intensifies. Government of India numbers show that 47% of adolescent girls remain chronically hungry and 56% of them are anaemic. It doesn’t have to be this way. Change can start one step at a time—one small candle can light the next one and that one the next…. The rally in Maira included an Amala Bharatam Cleanup of the village, Amma’s campaign for public cleanliness that is in support of the Indian government’s Swacch Bharat Mission. They discussed how vital it is to keep the village and surrounding area trash free. The rally participants also addressed the issue of becoming an open defecation free village and how this would bring better health to all people who live there. A plan to build toilets is in in the works. Overall, 4 men, 13 women and 20 children took part in the day’s events. This is in a village with a population of 290 overall. The candles are taking light.